Get to know this stylish vacation home at the foot of historical Assisi (5 km). From your lounge bed by the pool you have a wonderful view over the surrounding landscape and the world famous 13th century Basilica di San Francesco. The vacation home is on the ground floor where you have you a private terrace as well as air conditioning in the whole house. 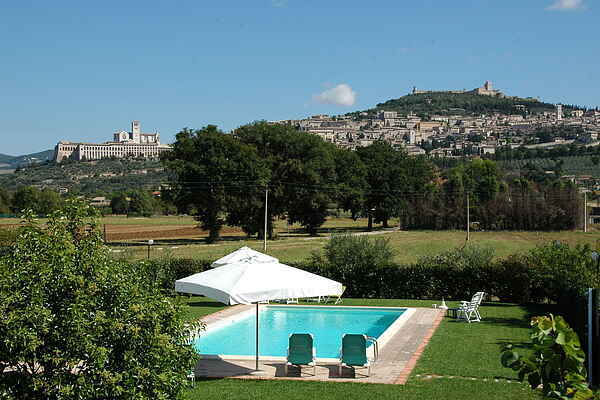 If offers a gorgeous view of the hill of Assisi. Lots of fig- and cherry trees can be found in the garden, you can pick them during certain times of the year. You can also use the collective barbecue. The Basilica di San Francesco of course has to be admired up close. Close to the house and alongside the Santa Maria degli Angeli Basilica runs the Franciscan walking path, a perfect way to get to the old town center. The Basilica is also worth a visit: the holy Franciscus died here in 1226. In Santa Maria degli Angeli (1 km) you will find grocery shops, post office, bank and several restaurants. Other well know places such as Perugia (20 km) and Gubbio (50 km) are easily reachable. A daytrip to Rome or Florence is easy by train; the train station is a fifteen minute walk away.